Annie Burke (1876-1962), a weaver who spent much of her adult life educating others on the ways of the Pomo, asked her daughter, Elsie, not to destroy her baskets upon her death. Elsie Comanche Allen (1899-1990) had a native artisan eye for esthetics, and she added to her mother's collection during the next 30 years, devoting herself to education as her mother had. She, in turn, appointed her oldest daughter, Genevieve Allen Aguilar (b. 1920), as the next guardian of the collection, who placed it on long-term loan to the Mendocino County Museum. Happy Camp : Naturegraph Publishers, 1972. Description: 67 p. ; ill., photos. Pomo basket weaver, studying with her from 1974 until her death in 1991. 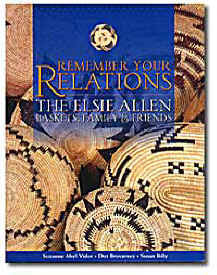 Examines the lives of work of the weavers whose baskets are part of the collection assembled by Pomo Indian basketmakers Annie Burke and her daughter Elsie Allen.